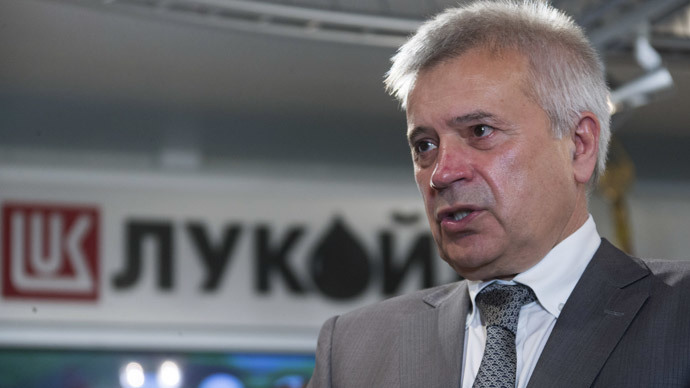 Russia’s second largest oil and gas producer Lukoil plans to return to Iran as soon as sanctions over the country’s nuclear program are lifted, according to the company’s President Vagit Alekperov. The company wants to return to the Anaran oil project which the company abandoned due to Iranian sanctions in 2010, Vagit Alekperov told reporters at the IHS CERA Week 2015 Energy Conference on Tuesday. Iran has between 20-30 million barrels of crude in storage that could potentially come to market in July 2015, adding to the global supply glut.The country plans to boost crude exports by as much as 1 million barrels per day once the sanctions over Tehran’s nuclear program are lifted. Lukoil is also considering buying assets in Iran as well as in Mexico after 2016, putting into operation a number of huge projects during 2015-2016, according to the company head. Alekperov also said Lukoil has already reopened an office in Tehran. Lukoil was forced to withdraw from Iran in 2010, after the United States imposed economic sanctions against Tehran. Prior to that, it jointly worked with Norway’s Statoil exploring the Anaran block that extends across the Iraqi border and is estimated to have an oil reserve of 2 billion barrels. The Russian company took a $63 million loss when it abandoned the project; however, in 2013 Iran reimbursed Lukoil $60 million. This comes as Iran and the P5+1 group of countries- the US, Russia, China, Britain, France and Germany - are working on a final agreement over the Iranian nuclear program which has a deadline of June 30. A key point of the agreement will be the removal of a series of economic sanctions on Iran – specifically some of those that ban foreign investment in the country’s oil and gas sector. Earlier in April, Iran and the international powers reached “solutions on key parameters” after eight days of talks in Switzerland. Under the deal Tehran is obliged to refrain from creating nuclear weapons. It agreed that the Natantz facility would remain as the only uranium enrichment site in the country while the Fordow facility is to be converted into a nuclear physics center with no fissile material. In 2006, the UN Security Council imposed sanctions on Iran after the country refused to suspend its uranium enrichment program. US sanctions initially targeted investment in oil, gas and petrochemicals, exports of refined petroleum products, and business dealings with the Iranian Revolutionary Guard Corps. Banking and insurance transactions, including those with the Central Bank of Iran, as well as shipping, web-hosting services for commercial endeavors, and domain name registration services have been also restricted. Tehran was accused of pursuing a clandestine nuclear weapons program by some countries, but insists that it only wants to use nuclear energy for civilian use. Currently, the sanctions include an embargo on dealings with Iran by the United States, and a ban on selling aircraft and spare parts to Iranian aviation companies.